Send the BibTeX info containing title, authors, conference/journal full name, date, and plain-text abstract (the abstract in the PDF file doesn't count), together with your PDF file to Yan Wang (yanwang AT ee DOT columbia DOT edu), better cc Hongzhi Li (hongzhili AT cs DOT columbia DOT edu). And Yan will take care of that and set your paper up on the simple bibliographic list. First send an email to Hongzhi Li (hongzhili AT cs DOT columbia DOT edu) to request the password. Follow the tutorial below to edit the details of your paper. Please use Chrome. Unsure whether other browsers work. How to add a figure? Find your paper and click "edit" button. 2. Input the URL of your image. If you don’t know the URL of you image. Please go to step 2-1. 2-1. If you don’t know the URL of you image. 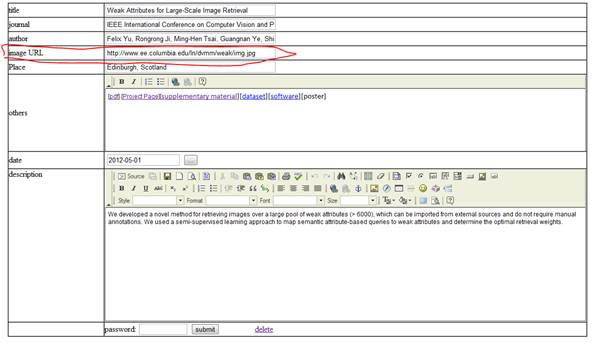 Upload your file (image or pdf), get the file url after you click the “submit” button. 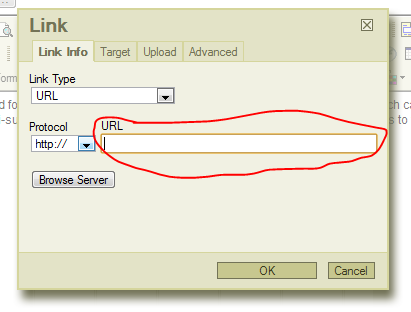 Fill the url to “image URL” field or the hyperlink field. 3. input the password and click submit. How to add links after paper information? 4. Input your url and click OK. If you don’t have your file uploaded before, you can visit http://dvmmweb.cs.columbia.edu/files/upload.html to upload your file and get the url. 5. input the password and click submit.